It’s a common misconception that any form of natural family planning (NFP) doesn’t work very well for women over forty because, oddly like teenagers, the body doesn’t produce the hormones that affect ovulation consistently and, therefore, following the natural signs of fertility is unreliable. I’ve had people knit their brow at me plenty for being irresponsible and depending on NFP, but perhaps they don’t understand the reasons why a middle-aged woman should pay attention to her reproductive biology. Even many Catholics myopically assume that anyone who uses NFP uses it to avoid pregnancy; but for a woman of any age, the main benefit of NFP is that it allows her to understand herself better. That is undoubtedly good. I’d even argue that if a woman’s hormones are changing during a phase of her life, there’s a greater urgency to follow those changes. Where’s the sense in deciding not to follow the changes just because there are, well, changes? Here’s why it matters: If a woman has a markedly decreased progesterone or estrogen level, the risk for miscarriage is significantly greater. From cycle to cycle this can differ quite drastically for a pre-menopausal woman, and the only immediate way to follow this risky fluctuation is to daily monitor fertility signs. There’s more to fertility than just getting pregnant, the body needs to be able to sustain the pregnancy too. Also, as is unfortunately true for many women, if there is a history of artificial contraception use, there is a greater risk for some reproductive cancers in older age. 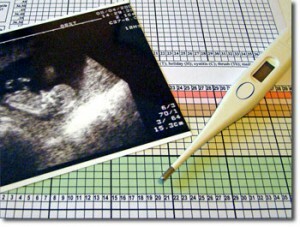 Changes in the fertility signs can indicate such changes in a woman’s health before a doctor can detect it. Further, and men this is for you, understanding the changes in hormone levels allows a pre-menopausal woman to better understand the changes in her mood and emotions. Middle age can be, at times, just as emotionally tumultuous as those teenage years, but maturity should bring with it some gracefulness, self-control, and wisdom. Personally, I can handle the mood swings and days of depression better if I at least understand why I’m feeling that way. It’s no small gift to my husband for him to know when to tread lightly so that he does not awaken that head-spinning monster that looks like his wife. Ahem. Think of it like this, charting bravely into the unknown over forty is a very intelligent, lady-like thing to do. Need information? I use the Creighton Model and highly recommend getting your own instructor. This is mine, an she is currently taking new clients.